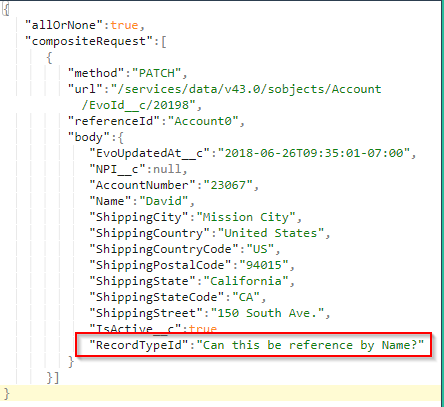 Is there anyway to reference an account recordtype by Name when creating an account using Composite API which has recordtypes? I am hoping there is a way so I don't need to do a get request to get a RecordTypeId and associate it with my accounts. Of course, this will fail if the user doesn't have access to the record type, or if more or less than one record type has this exact name for this object. This works anywhere that you could put a RecordTypeId attribute, including insert/update commands, composite commands, sobject tree commands, etc. Not the answer you're looking for? Browse other questions tagged api rest record-type or ask your own question. Adding object through REST API not appearing on chatter? Salesforce REST JSON Nested Self-Related Objects?